We are pleased to announce our 2018 summer camp will take place in America’s first and most revered National Park, Yellowstone. 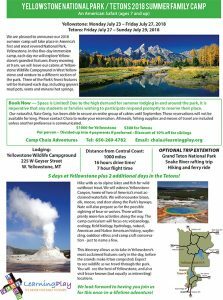 In this five day immersion camp, each day we will explore Yellowstone’s grandest features. Every morning at 9 am, we will leave our cabins at Yellowstone Wildlife Cabins in West Yellowstone and venture to a different section of the park. Three of the Park’s finest features will be showcased including geysers mud pots, vents and mineral hot springs. Hike with us to alpine lakes and fish for wild cutthroat trout. We will witness Yellowstone Canyon, home of two of America’s most acclaimed waterfalls. We will encounter bison, elk, moose, and deer along the Park’s byways. Nate will also prepare us for the possible sighting of bear or wolves. There will be plenty more fun activities along the way. The camp curriculum will focus on; volcanology, ecology, field biology, hydrology, natural, American and Native American history, wayfinding, outdoor ethics and camp craft conservation – just to name a few. This itinerary allows us to take in Yellowstone’s most acclaimed features early in the day, before the crowds make it too congested. Expect to see wildlife as we travel through the park. You will see the best of Yellowstone, and also visit lesser known (but equally as interesting) locations. Book Now — Space is Limited! Due to the high demand for summer lodging in and around the park, it is imperative that any students or families wishing to participate respond promptly to reserve their place. Our naturalist, Nate Greig, has been able to secure an entire group of cabins until September. These reservations will not be available for long. Please contact Chaia to make your reservation. All meals, fishing supplies and means of travel are included unless another preference is communicated. We look forward to you joining us on this once-in-a-lifetime adventure! Contact Chaia May (Director) for more information: (650) 269-4782, chaia@learningplaywithchaiamay.com. Our staff is made up of: seasoned, passionate professionals with many years of experience as educators interested in young people of all kinds’ well being. I have chosen each mentor as someone who is both a stellar role model in his or her profession and for his or her level of compassion. We welcome children who are: able to respond to directions for the most part. If they are not typically oppositional but have periodic upsets we have been able to manage well in the past and feel that we can insure their safety. Parents are welcome to join us: full-time, part-time or on an on-call basis if they would like to be present. We encourage parents to be part of our camp experience and benefit from whatever meets their needs best. If they feel most relaxed being involved we are very comfortable with that. The only caveat is if the parent has expressed a desire for the child to be more integrated socially and their presence inhibits that possibility. Regarding the question, if staff members from your company are welcome to be present to assist at the camp, as needed, the answer is yes. We typically attract: high-functioning children with autism and attention issues. We welcome more children/young people: who have a developmental age between 6-12 yet chronologically are older. Siblings under 6 are also welcome and are only charged the same incidental fees as the parents. We will have music and dance classes that are available for both parents and children throughout the week. Private classes will also be an option. There will be an evening performance on Friday and we will leave after lunch on Saturday. Our dates and times are: July 23 – 29. Social skill and leadership development will be an integral part of our goals and curriculum.